The City of Menlo Park was incorporated in 1874 as the community grew around the Menlo Park train station that made the area a popular residence for San Francisco businessmen. 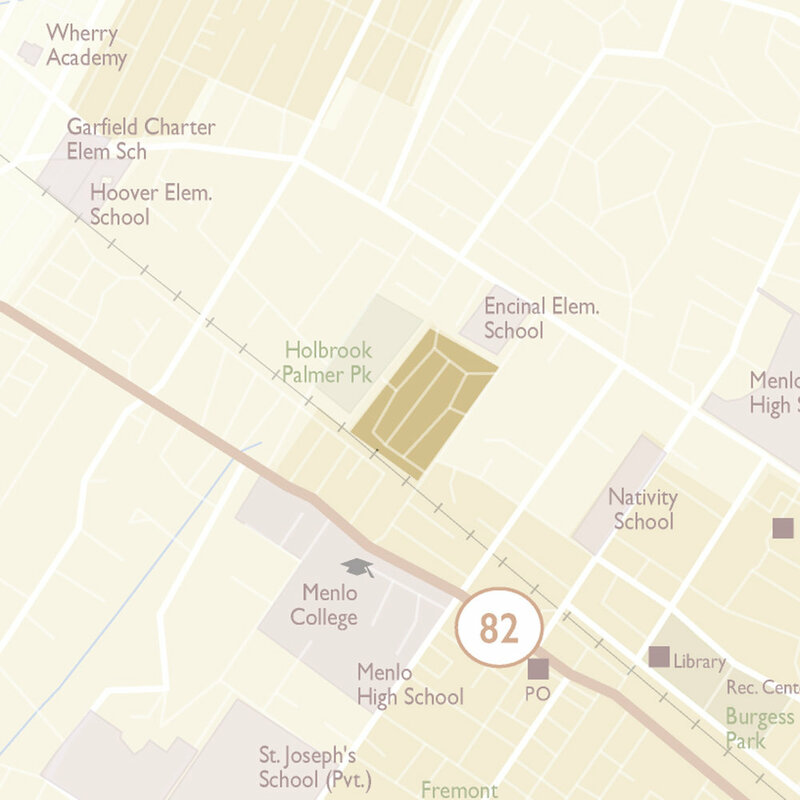 Almost a century and a half later, Menlo Park remains a sought-after address for commuters to San Francisco, as well as those who work in Silicon Valley and desire a top-rated school district. 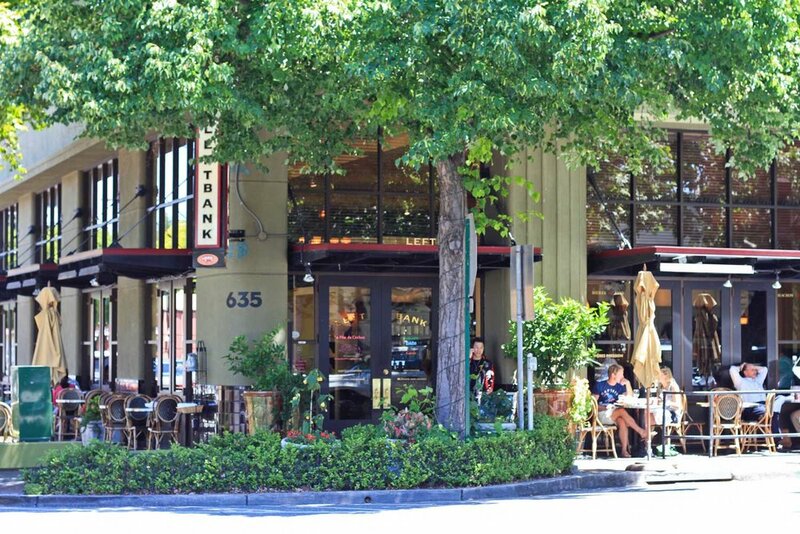 Menlo Park’s charming downtown on Santa Cruz Avenue is the heart of the city, complemented by nearby shopping and entertainment available in Palo Alto, Redwood City and Stanford Shopping Center. The Burgess Park recreation area and adjacent civic center complex is a thriving hub of community activities and resources. A strong public school system and the presence of several private schools make a Menlo Park address a favorite of school-aged families. All of its schools and community facilities have undergone upgrades within the past five years. A new state-of-the-art, multi-discipline performing arts center opened at the high school in 2009. Homes are varied and include turn-of-the-century bungalows and mid-century ranchers, along with modern estate-sized homes that have recently been built to replace older houses. 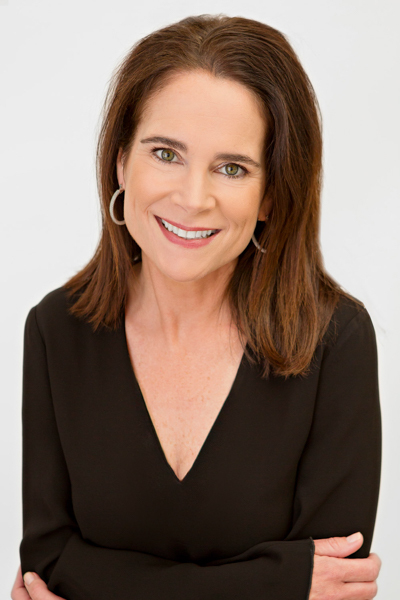 The approximately 32,000 residents that call Menlo Park home enjoy the excellent blend of suburban accommodations, privacy and peace, with the urban conveniences of a well-connected, vibrant city. Menlo Park elementary and middle school students belong to one of three districts: Menlo Park City School District or Las Lomitas School District for students west of highway 101, or Ravenswood City School District for students on the east side, with a few small pockets west of the freeway also attending Ravenswood schools. The divisions by grade vary depending on the district and school. Laurel Elementary has two campuses with the lower campus serving K-2 and the upper campus serving 3-5. All of Menlo Park is in the attendance area for Menlo Atherton High School which is part of the Sequoia Union High School District. Associated neighborhoods are listed with each school. Stanford Weekend Acres – as it’s also known – is an eclectic mix of small older homes and newer modern homes, many of them on private roads. 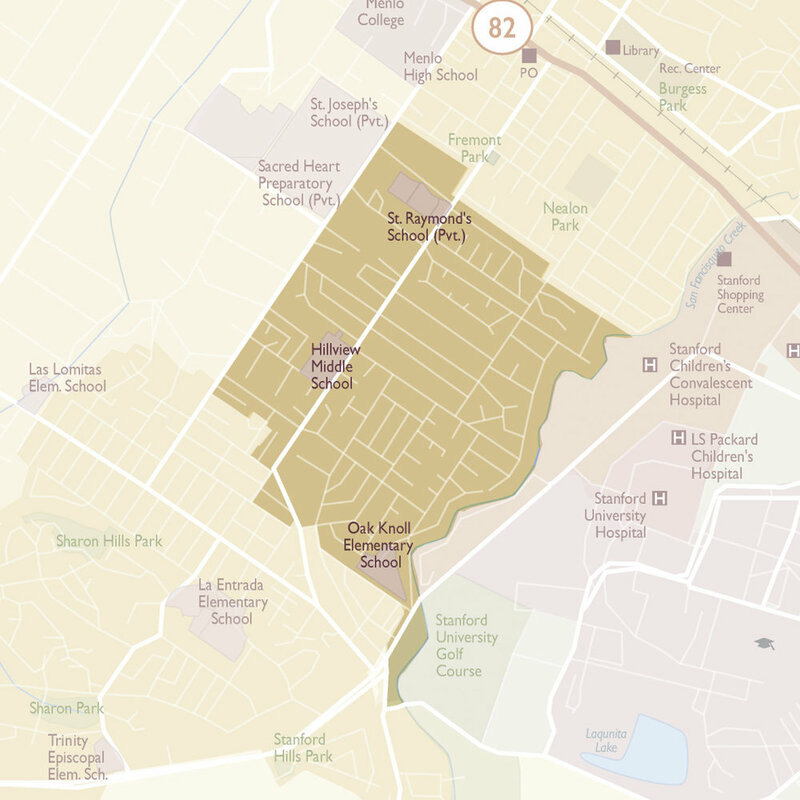 The neighborhood is tucked into a sliver of unincorporated San Mateo County. Bordered by Stanford University golf course, Alpine and San Francisquito Creeks, the area combines a rural feel with convenient location. Sharon Heights is a thoughtfully planned community with parks, open space, schools, churches, shopping, dining and a country club, amid a mix of single family homes, condominiums, townhomes and apartments. Hilly topography provides varied views of the Bay, western hills or golf course. Residents enjoy convenient access to highway 280 and Alameda de Las Pulgas. University Heights is a close-knit, family-friendly community centered around Alameda de las Pulgas in unincorporated San Mateo County. Within walking distance of restaurants and cafes, salons, fitness centers, and highly-regarded private elementary and pre-schools, it’s common to see families riding bikes and parents pushing strollers. Ideally located just west of downtown, Central Menlo is arguably the city’s most desirable neighborhood. Well-kept homes on large lots range from the older traditional ranch to the new modern farmhouse style. Children walk and bike to school down quiet, tree-lined streets in this peaceful, family- friendly neighborhood. Tree-lined streets, charming cottages, historic gardens, and the Allied Arts Guild, make Allied Arts one of the most charming neighborhoods in Menlo Park. Smaller lots make it an attractive entry point for buyers looking west of El Camino Real. Residents enjoy walkable access to Stanford Shopping Center and downtown shopping in Menlo Park and Palo Alto. Linfield Oaks is the kind of family-friendly place where it’s not uncommon for an impromptu neighborhood party to break out on a Friday evening. Burgess Park and the adjacent Civic Center provide many services and recreational opportunities for residents. The historic Menlo Park train station is the oldest California station in continuous operation. 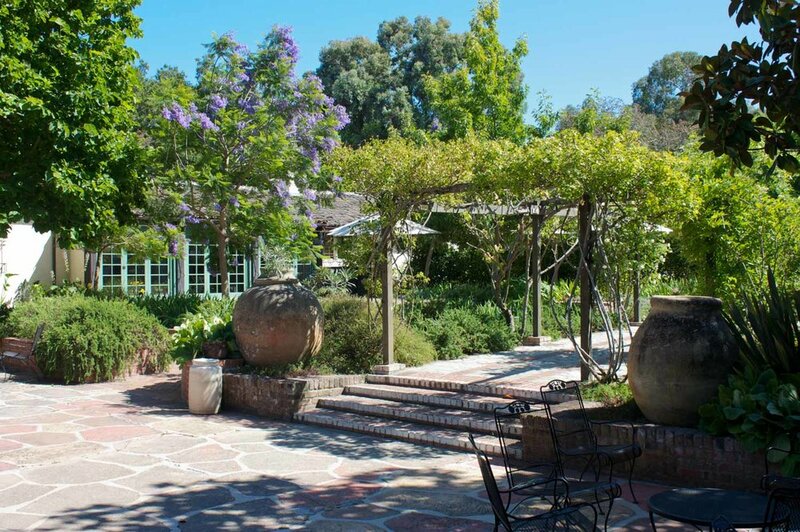 Tucked away on the border of Atherton, Felton Gables is a hidden gem, unknown even to many Menlo Park residents. Most homes were custom-built in the 1930s and 40s on the former estate of Senator Charles Felton. In recent years, many homes have been remodeled or rebuilt. Residents enjoy a “secret” path to the adjacent Holbrook Palmer Park. Tree-lined streets with no sidewalks give Menlo Oaks a rural feel. The area includes Vintage Oaks, a family-friendly neighborhood developed in the 1990s on land formerly owned by neighboring St. Patrick’s Seminary. Residents enjoy the larger size lots and peaceful location, without sacrificing the convenience of nearby shopping and dining. The Willows is one of the most family-friendly areas of Menlo Park. Known for its ambling, tree-shaded lanes, proximity to Burgess Recreation Center, downtown Palo Alto, and local shops and markets, it has grown in popularity with the rise of the tech workforce. Most homes are post-war ranchers on average size lots creating a close sense of community. This area includes the neighborhoods of Suburban Park, Lorelei Manor and the Flood Park Triangle – all friendly, active neighborhoods that are popular entry points into the Menlo Park market. Homes in these neighborhoods have easy access to Marsh Manor shopping, local commute routes, and of course, the popular grounds of Flood Park. First developed in the 1930s, the Belle Haven neighborhood includes the portion of Menlo Park to the north and east of highway 101. One of the most affordable entry points into Silicon Valley real estate, the area has seen massive change in recent years with the arrival of Facebook headquarters and the tech workforce that comes with it. North Fair Oaks is an eclectic neighborhood that includes 1930’s bungalows, 1950’s ranchers, and newly built homes. 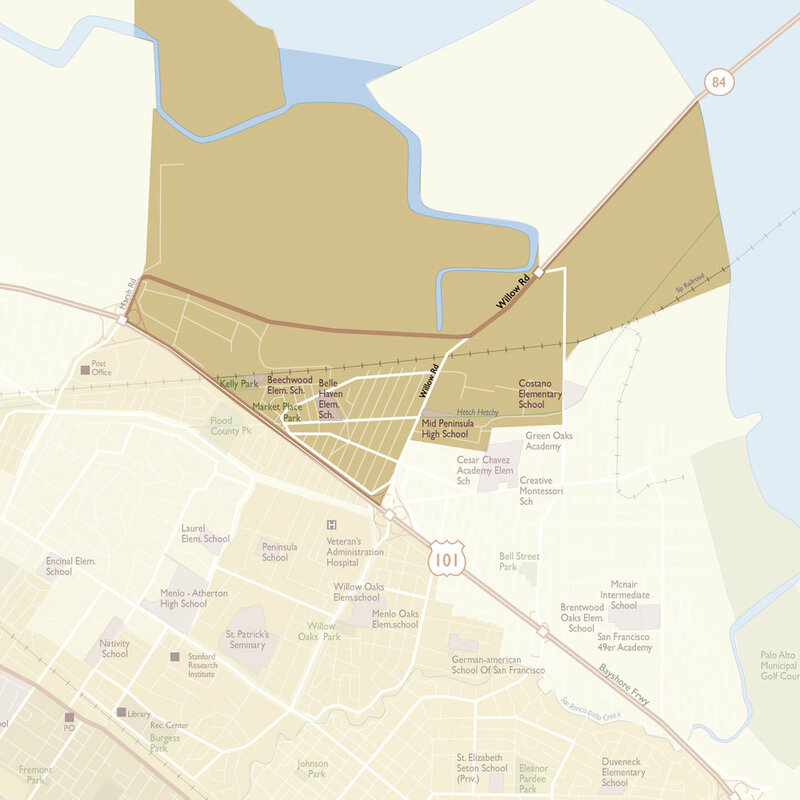 Located on the eastern side of Menlo Park, the area is in unincorporated San Mateo County. Traffic calming features make it a safe, walkable neighborhood. Abundant mature trees contribute to the pleasant feeling of the neighborhood.